I always feel a certain sense of satisfaction when my garden is finally planted. And so it is. 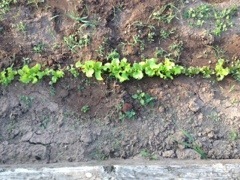 I spent the last two evenings first tilling under the weeds that had grown since the first go-round in April, then planting several more rows of peas, lettuce (photo below) and onions, plus beans, carrots, cucumbers, cauliflower and potatoes. tomatoes I could find in order to get ripe ones by early July. For those of you counting, that’s the third thing I pledged to do differently this year — the others being not tilling and planting everything in an eight-hour period and planting a few early crops.